Princess Elizabeth  can wear even elaborately-set jewels and look well in them. Now that the display of her wedding presents is over, she has received into her own possession the beautiful ornaments given to her on her marriage, and at a naval function which she attended with the Duke of Edinburgh  she wore for the first time the exquisitely-matched necklace of huge diamonds which were a present to her from South Africa . They are startlingly magnificent stones, and, with artistic taste, the Princess had chosen a black velvet evening gown, which set off their sparkling brilliance with great effect. Her Royal Highness does not often wear black -- she is very young, of course, to do so  -- and this was probably the first occasion on which she has appeared in black velvet. With her fair coloring and pretty hair the gown suited her to perfection and she was a picture as she sat in the box at the theatre where the function took place. 1. Princess Elizabeth of the United Kingdom (born 1926), later Queen Elizabeth II of the United Kingdom, was a newly-wed princess in 1948. Four years later, she became Queen following the sudden death of her father, King George VI. More than six decades later, she's still on the throne. 2. The Duke of Edinburgh (born 1921), born Prince Philip of Greece and Denmark, married the future Queen Elizabeth II of the United Kingdom in November 1947. 3. Here's a link to our post on the South African Diamonds. The necklace wasn't a wedding gift; it was actually a 21st birthday present. 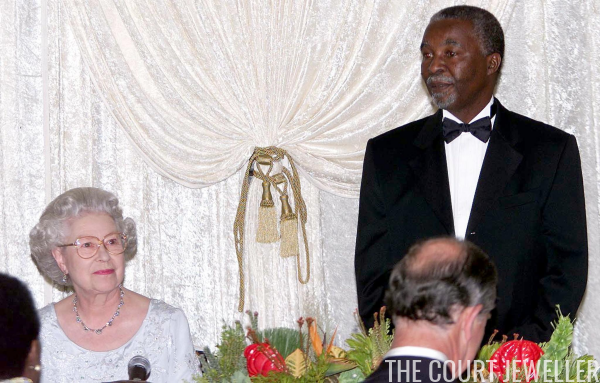 During a ball held on her birthday in 1947 at Government House in Cape Town, South African prime minister Jan Smuts presented the princess with the diamond necklace. In 1952, after the necklace was shortened, the removed sections were used to make a matching bracelet. Elizabeth also wore the necklace during the May 1948 visit to France (which you can see in two of the images included in this post). 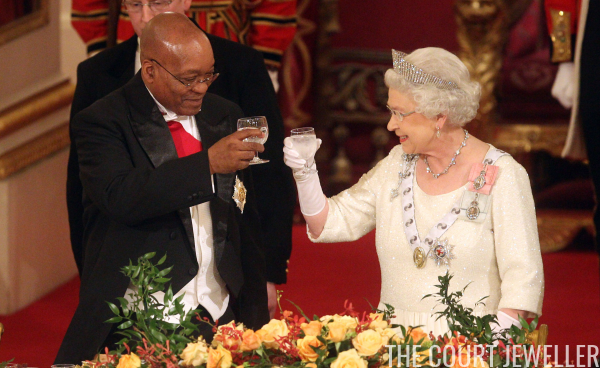 The Queen has often called the South African Diamonds her "best diamonds." 4. In March 1948, Elizabeth was a few weeks away from her 22nd birthday. The press had already begun (correctly) speculating that she was pregnant with her first child. Prince Charles was born in November 1948.